Shot this one from the Belmont Plateau on a brisk December morning. Hope you clik on the image to see it in a larger version, and on a black background. 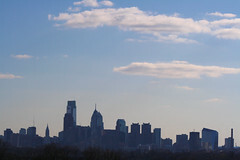 Perhaps you're from the Philly area..... and this shot reminds you of being "back home"
...Or you could be a visitor. In that case, The City of Brotherly Love welcomes you.
" 'Some Figment of her Imagination"